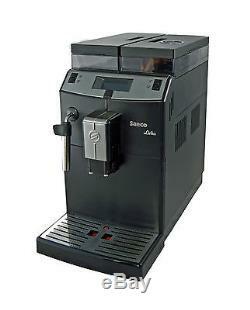 Saeco Lirika compact automatic Cappuccino Espresso coffee maker black RI9840 /01. In attractive design and sophisticated technology for the special requirements. 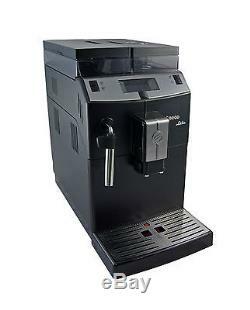 The Saeco Lirika Coffee is the new reference for compact coffee machines Commercial approval. With a width of only 21.5 cm, you will find accustomed Saeco Coffee is served in a confined space. With a height of only 38.1 cm lets you Easy to integrate into every kitchen line. The water tank holds 2.5L and the bean container is sufficient with 500 grams for the professional Operation. Stainless steel applications on the control panel as well as a Stainless steel cupboard provides solidity and the three color display allows Easiest operation. A B2B software with a credit menu is suitable for locations With product binding and the energy efficiency class A keeps commercial requirements was standing. Technical details: Basic housing made of metal, front and upper chassis ABS Water tank removable Container / water tank made of food-grade PP removable brewing unit 7-9 gr Use of different cup sizes possible Inclinable hot water / steam nozzle Water filter program and adjustment of hardness Automatic descaling program Stand-by operation (energy-saving mode) Coffee grinder Ceramic grinder (70db) Electromagnetic vibrating pump 15 bar Height-adjustable coffee dispensing up to max. 145 mm Hot water dispensing height 150mm Cappuccinatore optional as accessory Cappuccinatore Torpedo max. Height 120mm Cappuccinatore Pinless max. Height 125mm Double output coffee Certified according to CE, VDE Electrical Properties: Mains voltage 230-240 V / 50 Hz Power 1850 W Water specifications: Material boiler: stainless steel Number of boilers 1 Water connections: Water supply integrated water tank 2,5 L Water connection: no More functions: Bean container: 0.5 kg Set containers: 15 tabs Direct dialing: 4 Hot water production / hour (150ml): 100 Coffee production / hour (150ml): 30 Dimensions Width x Height x Depth: 215 x 381 x 430 mm Weight: 8 kg General: Saeco commercial registration Coffee beans in or on your new appliance are no cause for concern. Some items might come with a default language in German you will have to go in the menu and select the language you need or change on start-up. Electric items come with 2 round pin Europe style plugs, we will include an adapter depending on the destination country. Counties with strict custom rules and regulations like: Russia, Vietnam, Ukraine, Kazakhstan, Brazil, Chile, Uruguay, Israel, etc, may take longer due to strict custom rules and regulations, not couriers delay. We cannot control on know about this delay in advance. Clients must check their packages before accepting and signing for them. We cannot calculate this cost for you in advance. Most countries just add VAT on the declared value of the package. The rules are different in every country. Unfortunately we cannot know the rules, regulations or practices for each country. Please check the package before receiving the item. Items that are sent back should be sent with original packing and all accessories included in the package received. We try to maintain high standards of excellence. Eedback is very important to us. We cannot resolve any issue, if we do not know about it! We are always here and want to keep our customers satisfied, we will solve any issue that might occur. Please have a look at our. The item "Saeco Lirika compact automatic Cappuccino Espresso coffee maker black RI9840 /01" is in sale since Sunday, July 16, 2017. This item is in the category "Home & Garden\Kitchen, Dining & Bar\Small Kitchen Appliances\Coffee, Tea & Espresso Makers\Espresso & Cappuccino Machines".